Choosing a drum kit, or part of a drum kit can be one of the most overwhelming decisions you’ll make as a musician. Without choosing the right brand or company, you’re going to be left with a drum kit that doesn’t suit your style of play, and you won’t be able to create your personal sounds. However, if you’re looking for a customized drum kit, you’re simply not going to find this with your typical mainstream companies. 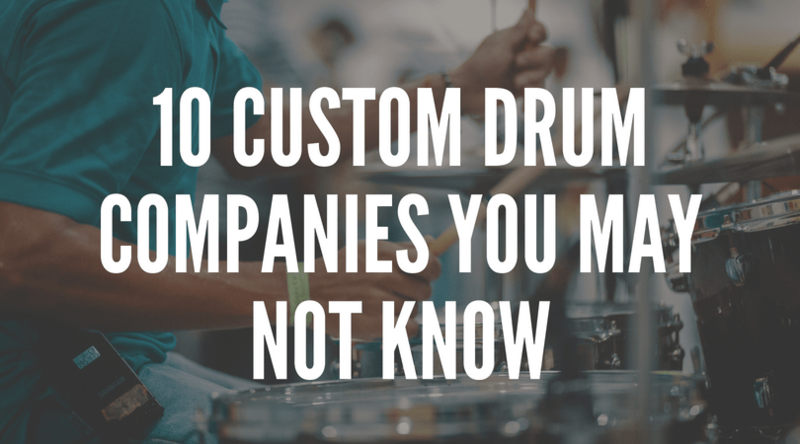 To help you find the best kit for you, today we’re going to explore the 10 best custom drum companies that produce fantastic products. Allegra Drums is an award-winning custom drum build company based in the heart of Vancouver. The company boasts the ability to create their own custom kits, as well as their premium contracts with leading manufacturers around the world. Founded in Georgia, USA, Outlaw pride themselves on creating and restoring vintage drum kits using tried and tested modern techniques. They can even produce high-quality kits from 200 to 600 years old wood reclaimed from some of the most intriguing sources. If you’re looking for a bespoke acrylic or wooden drum kit, Liberty Drums is your best bet. This boutique company is based in the UK and prides itself on its endorsement from American rock drummer Liberty DeVitto. Based in Canada, TRS provides plenty of premium quality custom and drum repair services. This company is capable of repairing all kinds of drum kit from any age and can build you a custom set from the ground up. Shaw Percussion is one of the oldest and longest standing drum companies in the world. Established back in 1866, Shaw is based in the UK and provides quality drum kits for musicians of any skill level. The Q Drum Company is the ideal choice for a custom drum kit if you’re looking for the rawness of a vintage kit, all produced with the quality of modern techniques. This leading manufacturer can be found in the heart of Los Angeles. Owned by Bill Cardwell, he is renowned around the world as a drum creation legend. With over 20 years of experience in the building industry, C&C Customs is one of the most trusted names in the music industry. Drum Sound can be found in the beautiful Turin region of Italy, and some have even called this the Ferrari company of the drum industry. These custom kits are renowned for being some of the best in the world where everything is created from scratch. If you’re looking for something a little different that is sure to catch your audience’s eye, this is the company for you. The aesthetic of these drums are out of this world, and the sound produced is of a high level that you probably wouldn’t expect! With a lifetime warranty on every set they make, Risen Custom pushes the boundaries of what it means to produce custom drum kits that musicians and fans will fall in love with. Be sure to check out their Glo (glow in the dark) kit! About the Author: Gavin Whitner is a passionate musician and an avid sports fan. He’s also the primary blogger at MusicOomph, where he likes to blog about musical instruments and gear in his free time.